Bismuth crystals are one of the easiest and most beautiful metal crystals to grow. These crystals are known for their rainbow colors that are caused by the oxide layer that forms on the metal. Bismuth crystallizes into an intricate geometric “hopper” form. You only need a few basic materials for this project. Basically, you need bismuth, metal containers for melting and crystallizing the element, and a heat source. Suitable metal containers include two stainless steel measuring cups, the bottoms of two aluminum cans, or even handmade bowls fashioned from aluminum foil. Bismuth isn’t something you pick up at the grocery store, but it’s available if you know where to look. I ordered mine off Amazon. You can also use non-lead fishing sinkers or non-lead ammunition. Fishing weights and ammunition should state they are made of bismuth. If you order the element online, I recommend reading user reviews to see if the purity is suitable for crystallization. There aren’t a lot of other uses for the pure element, so it’s pretty simple to find what you want. The element is not very expensive, plus once you get a sample that works, you can re-melt it again and again until you get exactly the crystal form you want. Many people are familiar with how to grow sugar or borax crystals. Metal crystals are different because you don’t dissolve the metal in a solvent. Basically, you just melt it and slowly cool it to promote crystal formation. 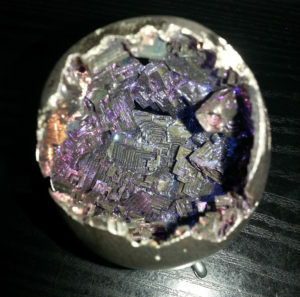 The melting point of bismuth is low for a metal (271°C or 520°F), so it will melt under high cooking heat, while a steel or aluminum container will remain solid. When the bismuth melts, the impurities in your sample separate out and mostly float. You can pour the molten metal away, leaving an element pure enough to crystallize. But, if you just melt the metal and let it solidify (freeze), the pretty crystals will be inside the solid. So, you let the bismuth start to crystallize and then pour the excess liquid away to expose the part you want. Pour the bismuth into a metal dish and heat it over high heat until it metals. Most likely, you’ll see a skin form on top of the the liquid. This is normal. Preheat the second container. Carefully pour the melted bismuth from the first container into the second one, trying to avoid pouring the “skin” into the second container. Now, the “trick” is to cool the melted bismuth slowly enough to get crystals. If you have the second container on a burner, leave it there but turn off the heat. Another option is to slowly turn down the heat until it is off. Since you can re-use bismuth, you can figure out what works best for you. When you see the bismuth starting to solidify, you want to pour the liquid away from the crystals that are forming. You can pour the metal back into the first container. How do you know when it’s time? 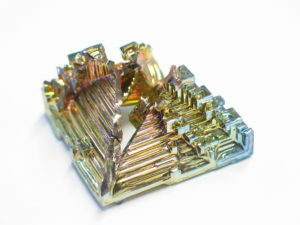 It takes around 30 seconds for bismuth to start solidifying once removed from heat. Otherwise, pour the liquid away when the bismuth seems set but jiggles a bit when bumped. Let the crystals cool completely before snapping them out of the container. The metal starts blue-gray, but quickly oxidizes in air to produce colors. If you have trouble getting the crystals out of the metal container, try chilling it in the freezer briefly. You can use tin snips to cut an aluminum can, if necessary. Another option is to remelt the metal and use a silicone bowl as the second container. If you do this, be careful! The melting point of silicone is only slightly higher than that of bismuth, so there is a chance the silicone may liquefy. Be sure there is a pan under it to catch the metal in case this happens. It’s a good idea to wear gloves, eye protection, and covered shoes, in case you spill the hot metal and it splashes. This is common sense for any project involving heat. Bismuth is considered a heavy metal, but it’s much less toxic than most (hence its use in Pepto-Bismol). It’s still not something you want to intentionally ingest, so it’s best to use metal containers only for this project and not for food. The crystals are generally considered safe to handle and to display.